This is the final review of the three summer promotional items that I tried in London back in August. The other two, were the Cheese and Onion Bites and the Wispa Gold McFlurry. 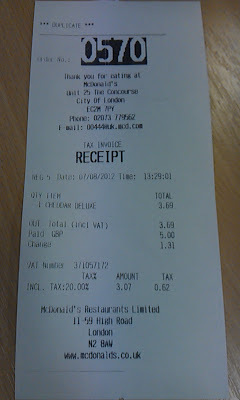 I was mostly disappointed with the other two items, so hopefully this 'Deluxe' burger could fair a little better. 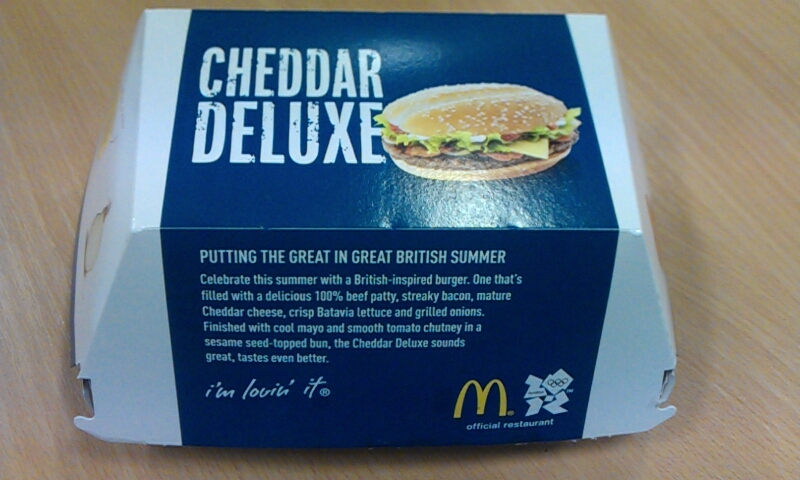 At first glance, it didn't seem all that interesting, if you click on the photo of the box to expand it, you can read their promotional copy explaining the burger. Simply, its just a larger patty, with aged cheddar cheese (hence the name), Batavia lettuce, 'streaky' bacon, grilled onions, 'cool' mayo topped with a tomato chutney. No overly strange toppings that you see on the promotional burgers in Asia, but at least it was more than just an oversized burger (as I would see a few days later in Copenhagen, when I passed on their large promo burgers). 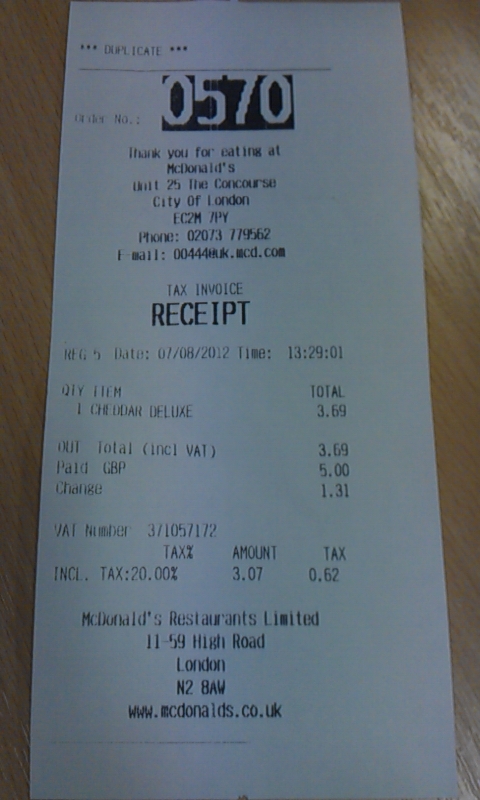 At 3.69GBP, it had a slight premium over the regular menu, but really not all that much. I opted against a combo, as it would have added nearly £1.50 to my meal, and I though it came with a free Olympic glass, I walked across the street to Sainsburys to buy a healthier and cheaper side and drink to accompany the sandwich. 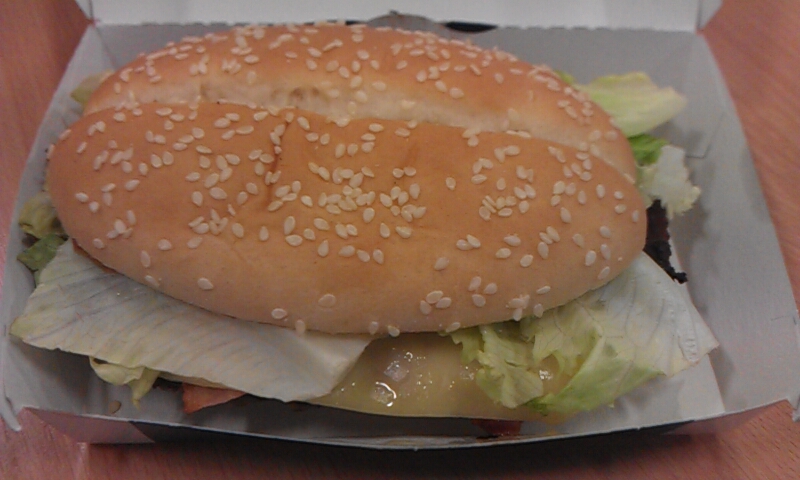 The burger itself was pretty good. The standout topping was the grilled onions, as they added a nice flavour to the cheese. As a kid, I loved eating 10 year old cheddar, granted, McDonald's probably only 'aged' the cheese for a week or so, but at least it was a proper slice of cheese, rather than the processed 'American' cheese they usually slap on their burgers. So even though it wasn't that old, it still tasted decent enough.The 'cool' mayo, didn't seem anything different than standard mayo, but the Tomato chutney was had a nice texture, and though I found it a little too sweet, it wasn't anything to take away, and all in a pretty good addition to the rest of the flavours. When I ordered it, I really didn't expect all that much, but I was pleasantly surprised with the result. Beef : 100% Pure Beef. No additives, fillers, binders, preservatives or flavour enhancers. Just pure forequarter and flank. A little salt and pepper is added to season after cooking. Sesame Seed Topped Oval Bun : Wheat Flour, Water, Sugar, Yeast, Vegetable Oil (Rapeseed Oil), Sesame Seeds, Salt, Soya Flour, Emulsifier (Mono- and Diacetyl Tartaric Acid Esters of Mono- and Diglycerides of Fatty Acids), Palm Oil, Preservative (Calcium Propionate), Flour Treatment Agent (Ascorbic Acid)Mature Cheddar Slice : Cheddar Cheese (Pasteurised Cow’s Milk, Salt, Starter, Rennet (Microbial))Lettuce (Batavia) :100% Batavia Lettuce.Cool Mayo : Water, Vegetable Oil (Soya Bean or Rapeseed Oil) (38%), Free Range Egg Yolk (4%), Modified Maize Starch, Spirit Vinegar, Sugar, Salt, Mustard Flour, Stabiliser (Xanthan Gum), Preservative (Potassium Sorbate), Lemon Juice ConcentrateGrilled Onion : OnionTomato Chutney :Sugar, Water, Diced Tomatoes (17.00%), Diced Onion (10.00%), Spirit Vinegar, Tomato Paste (7.00%), Caramelised Red Onion (Red Onion, Balsamic Vinegar (contains Colour (Plain Caramel)),Sugar, Sunflower Oil, Hibiscus Extract, Rosehip Extract), Modified Maize Starch, Herb, Salt, Red Chillies, Garlic Puree, Spices, Preservative (Potassium Sorbate), Sunflower Oil, White Wine Vinegar Streaky Bacon : Pork Belly, Salt, Preservative (Sodium Nitrite), Antioxidant (Sodium Ascorbate). Made with more than 220g pork per 100g of finished product.